I’ve known how to knit for more than 20 years, but I only learned to crochet last year. I tried to teach myself crochet at the same time I taught myself to knit, but never quite got it right. So last year, my friend Stacy taught me how to crochet. In that year, I’ve crocheted dishcloths. That’s all. I wanted to expand my crochet skills, but just hadn’t gotten around to it. Then I discovered that the Ravenclaws are planning a Blanket Square Term for the Harry Potter Knitting / Crochet House Cup (HPKCHC). I decided to jump on the bandwagon. My plan is to crochet 35 seven- to eight-inch granny squares, assemble them into a blanket, and send it to Afghans for Afghans. I picked out yarns from my stash that I had no plans for, and which have been in my stash since I started knitting again in 2007. The yarns are all worsted weight. 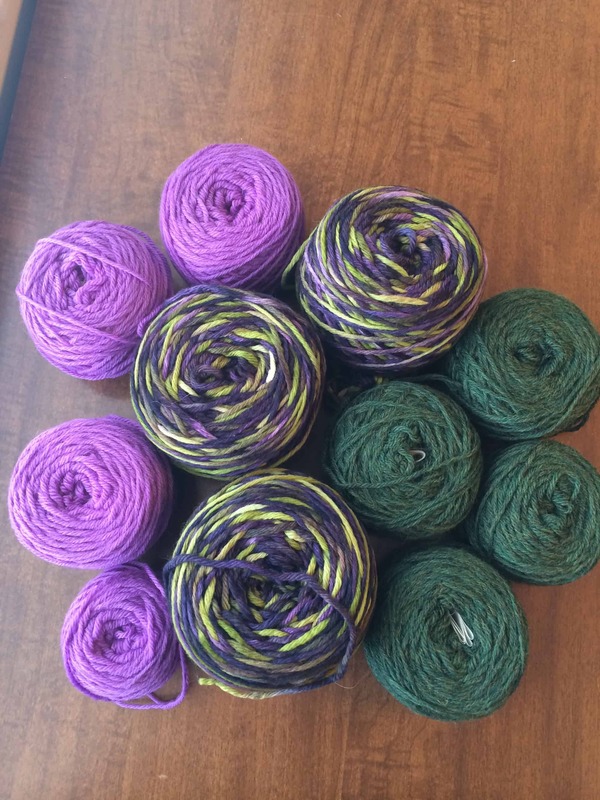 The yarns are 3 skeins of 100purewool Merino Worsted 3 ply in shades of green and purple, 4 skeins Knit Picks Wool of the Andes in Violet, and 4 skeins Knit Picks Wool of the Andes in Forest Heather. I wasn’t sure if this was enough yarn, or if the 100purewool and the Wool of the Andes would crochet to the same size, so I decided to make a square before the term started, so I could figure out the details of the blanket. 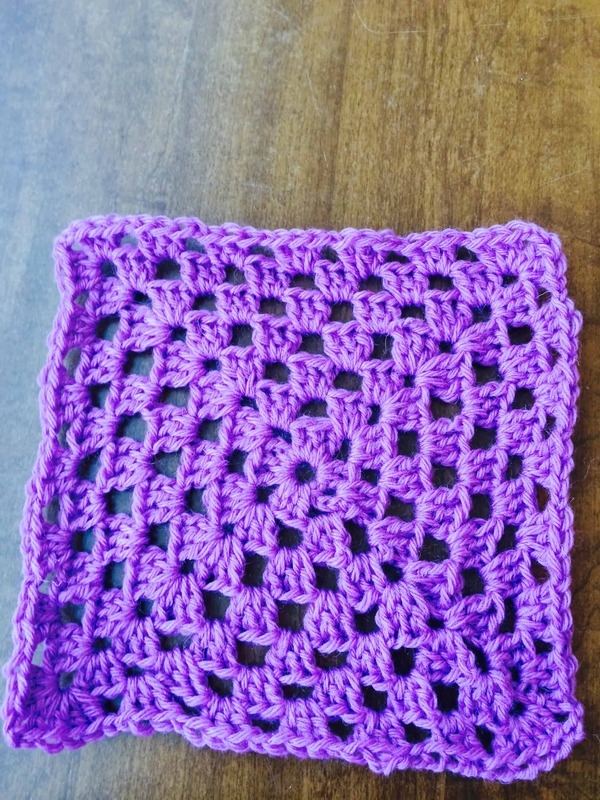 I watched several videos on YouTube to learn how to make a granny square. It took me about 1.5 hours to crochet the square. As a brand new crocheter, I thought that wasn’t bad. I was also happy with how the square looks. It is smooth. No buckling, and neat, grid-like segments. The square weighs 20 grams. Since Wool of the Andes come in 50 gram skeins, I should be able to get 2.5 squares per skein. That is 20 squares of Violet and 20 squares of Forest Heather. As long as I can get 15 squares out of the 100purewool skeins, I will have enough to make the blanket.